During WWI, much of Western Europe was reduced to a massive battlefield criss-crossed by a seemingly unending network of trenches. 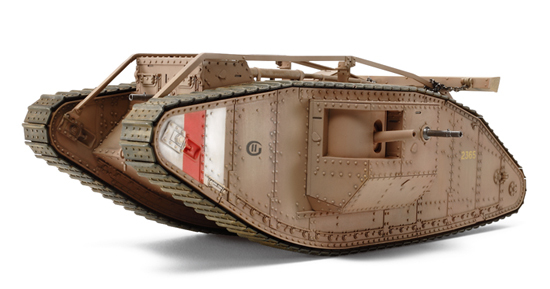 The original British Mk.I tank was developed to break the deadlock; the Mk.IV was a later model based on many of the same design principle, and of which around 1,000 were produced starting in March 1917. A "Male" variant was developed to smash through enemy lines and in addition to machine guns it utilized large 6-pounder guns, in contrast to the separate Female variant equipped with only machine guns for armament. 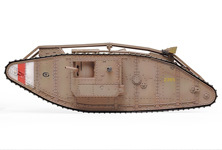 The Mk.IV saw a variety of action, including a mass deployment of around 400 at the Battle of Cambrai in November 1917, additionally prevailing in the world's first tank on tank battle with the German A7V in April 1918. 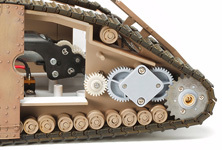 This plastic model assembly kit accurately recreates the unique form of the British Mk.IV Male tank and is motorized to allow dynamic forward motion. ★1/35 scale. 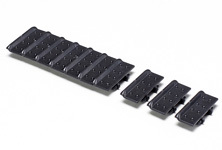 Length: 230mm, width: 143mm. 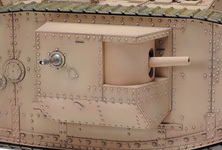 ★Fine molding faithfully recreates the flat armored panels with numerous rivets. ★Pre-assembled motor and gearbox unit included. 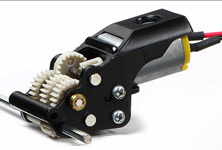 ★Durable metal sprockets transmit motor power. ★Moving link type assembly tracks make for realism and easy assembly. ★Comes with 3 marking options. ★Requires one R6/AA/UM3 battery (1.5V) (separately sold). ★The form of the Mk.IV Male differs greatly from more familiar WWII tanks, and is captured excellently by the model. 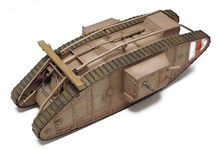 ★The Mk.IV's rhomboid design was intended to allow it to traverse the large trenches which characterized the WW1 battlefield. 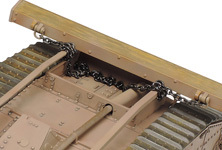 ★Parts depicting 6-pounder guns and Lewis machine guns are movable. 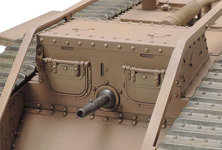 The 6-pounder mount and breech are also depicted inside the sponson. ★Choose between open or closed depictions of the observation flaps. Note that here too, Lewis machine gun is movable. 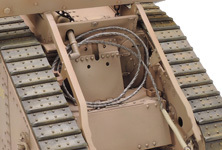 ★The unditching log, used for helping the Mk.IV to escape when stuck in poor terrain, is attached with metal chain parts. ★An excellently detailed finish also includes recreations of the fuel tank box, exhausts, tow rope and much more! ★Power is transferred from the gearbox to the drive sprockets via gears, providing the model with energetic forward motion. ★Small motor comes pre-attached to the gearbox unit, saving time on assembly and fitting neatly inside the Mk.IV model. ★Realistic link type assembly tracks are designed not only to handle the movement of the model, but also for easy assembly. 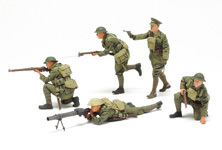 ★Tamiya is simultaneously releasing Item 35339 WWI British Infantry Set. Click on the image above to be taken to the Item 35339 page. ★See the Mk.IV in motion!! * Model requires a mixture of XF-52 Flat Earth & XF-55 Deck Tan. One R6/AA/UM3 (1.5V) battery (sold separately). The information on this page is current as of July 4, 2014. Specifications are subject to change without notice.